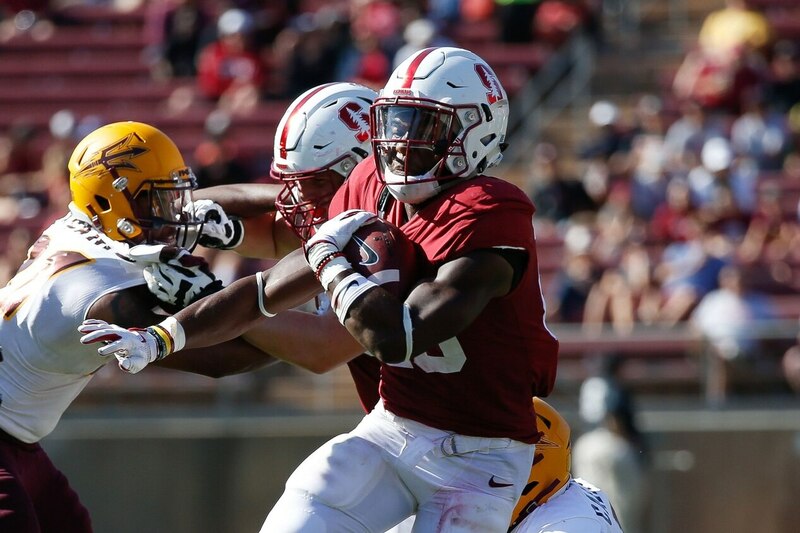 While many of his peers have already declared for the 2018 NFL Draft, it appears running back Bryce Love is leaning toward staying at Stanford for the 2018 season. Matt Miller of Bleacher Report wrote Monday that people at Stanford think Love is going to stay at Stanford, rather than declare for the draft. Love finished the season with the second-most rushing yards in the nation. He piled up 2,118 yards and 19 touchdowns on just 263 carries, averaging an absurd 8.1 yards per carry. He also set an FBS record for most runs over 50 yards in a season and routinely broke off long gains for touchdowns, like this. This was even more impressive due to a couple factors: He was for much of the season the only real offensive threat Stanford had, and in the second half he dealt with a very painful ankle injury that he powered through. If Love does decide to come out of school early and declares for the draft, then he’d likely be a Day 2 pick. Though he’s not quite up there with the likes of Saquon Barkley, Derrius Guice and Ronald Jones II in terms of draft projections, there’s no doubt the young man has a future at the next level. If he decides to remain in school for another year, Love will be one of the top headliners for preseason Heisman favorite in 2018.